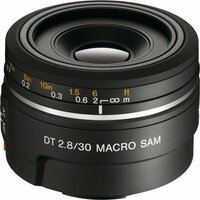 The Sony DT 30mm f2.8 SAM Macro Lens is a light and compact macro lens with built-in Smooth Autofocus Motor (SAM). For extremely clear and life-size close-ups, the 1:1 magnification ratio and 2cm minimum focusing distance makes it ideal for flowers, insect and small subject photography. The lightweight and compact design ensures an easy to carry and high quality optical performance fixed focal length DT lens, specifically for APS-C sensor cameras.